San Francisco has a brand new ice rink right in front of beautiful City Hall. 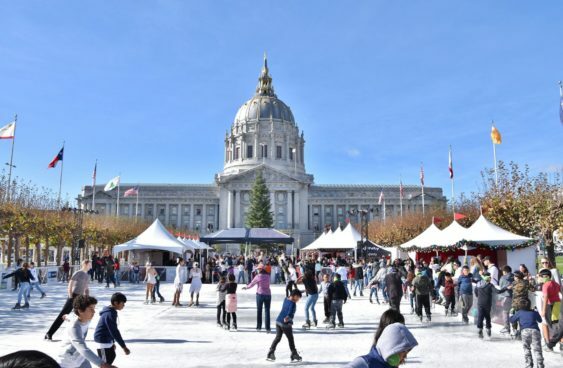 Modeled after the internationally-famed Wiener Eistraum ice-skating rink in Vienna, Austria, The Winter Park is San Francisco’s first holiday ice rink and track—and the first attraction of its kind in the Bay Area. In addition to the ice rink, the 400-foot skating track will weave ice skating fun through a lighted tree forest. Want to check out the new ice rink? Well, on Friday, December 7, you’re in luck because there will a free skate night on Friday at 6 & 8 pm. Xfinity is covering your session plus your ice skate rental while you enjoy free games at the kids zone, a photo booth, giveaways and raffles. This is event is first come, first serve. Arrive early. space is limited to the first 400 people per session. No rainchecks.